If you are like me, whenever you tell yourself that it is okay to let go of the to-do list, the worries, and your thoughts about the future, your mind comes back with some smart-alecky retort. Quieting the mind in order to bring presence into your life, leading to peace and ease, can feel like a baseball game where you are always the Chicago Cubs. You have a distant memory that you were on the winning side of inner peace at some point, but it was so long ago you can’t even be sure it was real. So you keep telling yourself, “Wait till next year!” Yet year after year that sense of inner peace you know is attainable always seems one season out of reach. 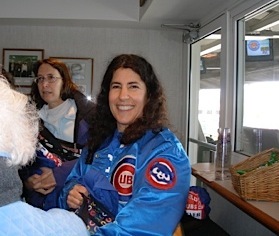 I will say this about my mother’s beloved baseball team, the Cubbies sure have had a lot of practice. Luckily, when it comes to inner peace, there is never a World Series that you are missing out on, but rather season after season of practice. There is no way to fail, only ways to proceed and succeed. One of the peace games that “tricks” my mind into becoming still, is called “For This Practice.” I set rules for small actions that bring my focus away from thinking and into the present. When I’m getting ready for bed at night I’ll say, “For this practice I don’t need to think about what I have to do tomorrow,” and proceed to wash my face and put on my pajamas paying special attention to the physical experience of each action. When a thought pops up in my mind I’ll remind myself, “For this practice I don’t need that.” This tells the mind it can think about what it wants to afterwards, but clears a space where you can be free from thought and at peace. What rules could best serve your experience of inner peace “for this practice?” Think about your routine activities and choose a few that you can set certain parameters for. You can also use “For This Practice” whenever your mind has gained unwanted momentum and control in your field of attention. For example, if a worry pattern comes up, choose a simple task and say, “For this practice I don’t need to run over these worry thoughts. For this practice the object is to pay attention to…” Setting concrete boundaries for intentional moments of presence will give you more “wins” than the cubs have seen in the last one-hundred years.